As I write this, I am faced with a dilemma. I live in a wide roofed, split entry house surrounded on three sides by mature, sun reaching oaks, maples and American Beech trees. Every fall, each leaf-bearing tree has its own rhythm of retreat. The maples caste off thick and firm yellow, red and orange leaves, whereas the oak leaves turn russet and curl at the edges while the abundant American Beech thin out to a papery beige with the feel of tissue. October winds funnel down the forested back hill casting bowers of leaves up and onto the roof, across the back patio, along the driveway. Caste-off leaves on land are no problem. We rake. We pile the leaves onto a tarp and drag them to a kind neighbor’s compost pile. The flight-born leaves settle into gutters; they require helpers with good balance and sturdy ladders to scoop out the debris. On the first day of frigid temperatures, the roof cleaners arrived. It’s my practice to greet helpers, to ascertain the job. I exited the side door to encounter their high paneled truck with the engine on, idling in the driveway. The cab was empty; two men were already at work on the roof. My dilemma was immediate. Do I yell up to them on the roof? Do I shout out the effects of idling, that 10 minutes of an exhaust’s idling pours one pound of carbon dioxide— a harmful greenhouse gas—into our atmosphere? In the two minutes it took to climb the steps, I chickened out. I had been waiting for the roofer to send these men since late July to seal the seam of a glass roof panel. Today’s gig was to complete that additional task. I was grateful these men had come. It was bitter cold. I understood their need to hunker down in a warm cab after facing a blasting wind at roof’s edge. Was it my job to educate these men about idling? I came away thinking if I were to speak to anyone, it needed to be the owner. His truck was in violation of the Massachusetts Anti-Idling Law, which limits unnecessary engine idling to five minutes. I had no timer on that day but surmise the idling lasted for at least fifteen minutes, maybe more. I’m not a comfortable whistle blower. I’ve met the owner. He may have no awareness of the law. According to WCAP, The Wakefield Climate Action Project, the anti-idling law is rarely enforced or publicized on the local level. They suggest I send an e-mail to noidling@wakefieldcap.org to show support. Following that, they recommend I tell town officials that I promote the enforcement of the anti-idling law by sending e-mails and attending town meetings. This sounds do-able and right to me. Thus far, 19 states have enacted anti-idling laws. I am grateful to be reminded how a simple turn of the ignition key can make a difference, how one simple step can contribute to our planet’s sustainability, how writing this post might inspire others. This entry was posted in Mindfulness, Nature, Relationship(s), Sustainability, Uncategorized, Well-Being and tagged anti- idling, climate action, emissions pollutants on January 18, 2016 by fayewriter. Faye, thanks for the education on idling. I for one had no idea how damaging it could be and so important during these winter months when we all may be tempted to “warm up ” the car before taking off. Most grateful, I will pay more attention. Pat, Thumbs up! I so appreciate your candid response. You were in a real dilemma with regard to whether to temporarily stop their roof work, because of environmental hazards from their truck emissions, or whether to just finally get the “work done! !” I would have evaluated the situation pretty much the way you did; I might have informed the workers of “the present environmental laws” when they descended from the roof. I find it important that you brought the wider issue to the forefront, so we are all informed. I’m delighted for you that they finally came and did the work! Yes, it was a real dilemma and writing about it helped. Point of fact, even though there are laws on he books,there is not much effort to enforce or inform. I’m learning that it is far more complicated than I imagined and hope to learn more for the future. Thank you for your reading & support. As always…girlfriend! a very thoughtful piece. liked the back and forth on how to respond to the idling issue. Wonder whether you talked to the crew after they were back in the cab about idling etc. or consider an email to the owner. Also liked the details about the trees and their distinctive leaves. Hy, Thanks for your response. I didn’t chat with the crew as there was a complication with my understanding of the job and yes, I have, still am considering an e-mail to the owner. These mixed connections are complicated! I’m pleased you like my description of the leaves. They are quite amazing in their variety. 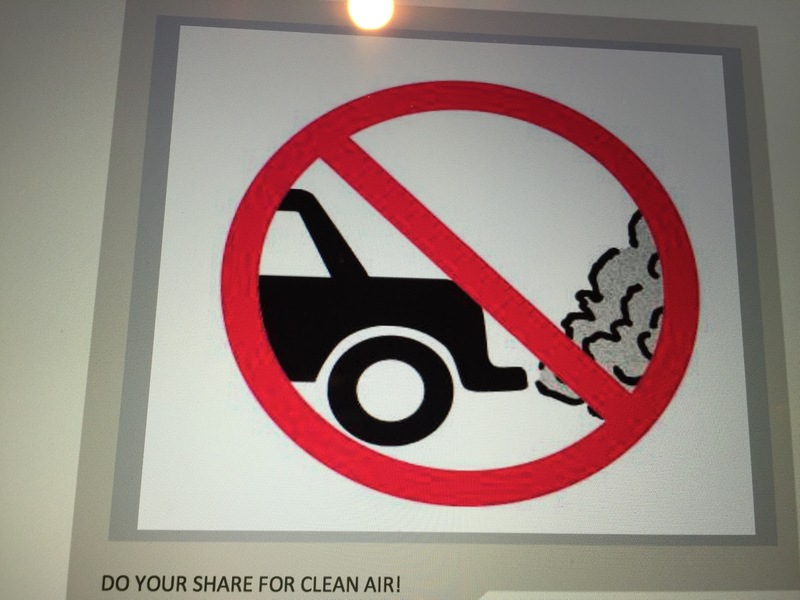 I had no idea about such laws or even the effects of idling…and I’m not proud to say that. Thanks for the education! I applaud you for going forward on this and I also think that had you spoken to the roof guys, they probably would have shut off the engine without a hitch. You have a kindness about you and they would definitely feel that. Hannah, thanks so much for your comment. I wish I had followed through. I had every intention but circumstance were such that the roofers left early and without completing the window seal part of the job I had been communicating about since summer. The timing wasn’t right. Afterwards, of course, I had time to think it through and decided on Plan B and maybe Plan C. Sustainability and the effects of our carbon footprint is a topic I have been engaged with for quite some time. P.S. The roofers came by on a “warmer day” last week and completed the job AND their engine was off.